Vanuatu is not a country noted for its beer. It has Tusker, a generic lager, which also comes in lemon flavour and is surprisingly perky and easier to drink than its blander brother. Instead, Vanuatu has a drink known as ‘kava’ (not in any way related to the French sparkling wine of the same pronunciation), a drink performing the same task as beer traditionally was in Western society in that it’s drunk in bars, almost exclusively by men, at the end of the working day, and is one which changes your mood as you drink it. It’s popular across Melanesia but Vanuatan kava, and particularly that from the island of Pentecost, is generally considered the best (and indeed people on Fiji import it rather than drinking their own). As you’ll see, ‘best’ is maybe a subjective term – ‘least worst’ might be closer to the mark – but of course, as always, Your Mileage May Vary. 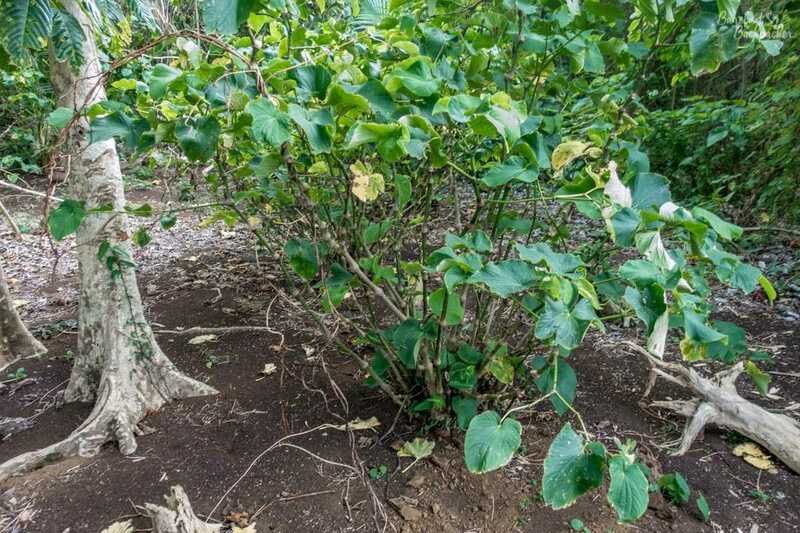 The kava plant – this specimen was on Gaua. The basics; Kava is made from the roots of a plant – specifically, a plant known by the technical name of ‘Piper methysticum’, a phrase that was translated from ‘intoxicating pepper’. My research for this blog reveals this isn’t just a phrase – it lies in the same genus as peppercorns, though as the name implies (and as we shall see later), I’m not exactly going to grind any part of this plant and use it in one of my curries. It’s native to the Pacific Islands area (it grows best in areas with high rainfall, high humidity, and temperatures in the high 20s°C), and is culturally one of the most important plants in the region, though on Vanuatu the drinking of kava is seen more as a casual social event than on islands like Samoa where it seems much more ritualised. 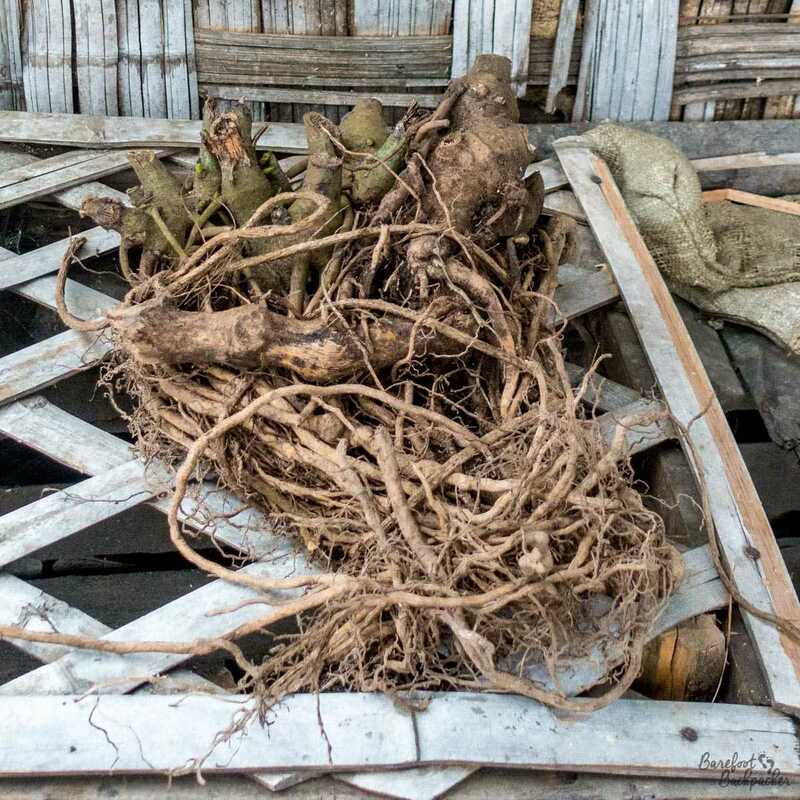 The roots of the kava plant, ready for processing. The drink is made in highly sterile laboratory conditions. Traditionally the root is chewed into a paste, spat out, mixed with a little water, then filtered through an old sock or sack, before cold water is added and the resulting concoction is drunk. These days it’s deemed more efficient to pound the root with a pestle & mortar, but this apparently changes the taste a little. It’s alleged that Christian missionaries banned the consumption of kava last century, not for its effects, but because they perceived its production method to be … dubious. Preparing kava – the pounded roots, the Hessian sack, and some washing-up bowls to catch it in and serve from. 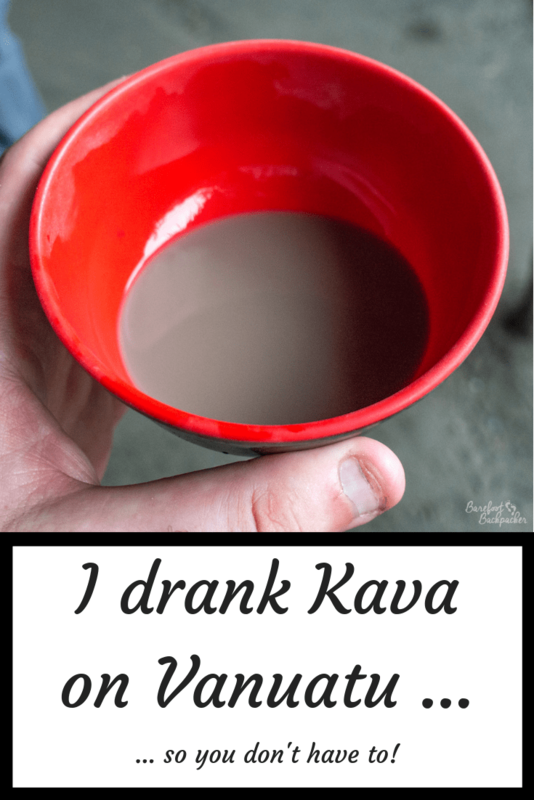 Although essentially a ‘home-brew’ drink, Kava is sold in ‘Kava Bars’. Traditionally these were village meeting places called ‘nakmal’ where important business would take place, but nowadays they’re much less grand – sometimes buildings that look like long cottages, but are often merely two walls and a roof; a simple shelter from the elements. 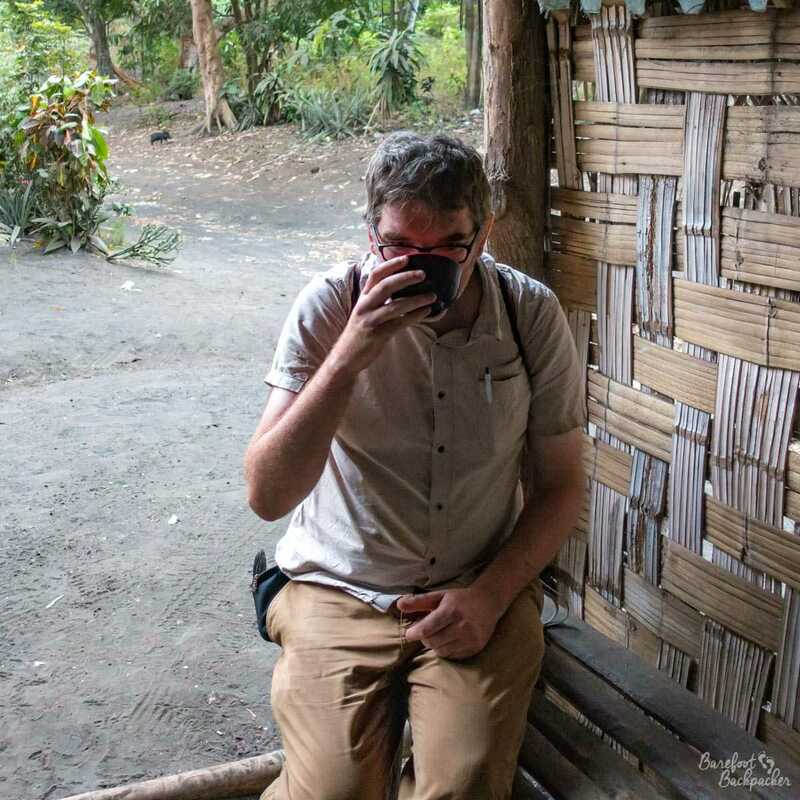 Every village will have at least one, and often more; my solitary experience was at one of the three or four kava bars in a village in West Ambrym that we passed on the way back from the shops at the local harbour. Like a traditional British pub, locals will tend to favour one over others and have a ‘regular’ bar, rather than go on a bar-crawl. 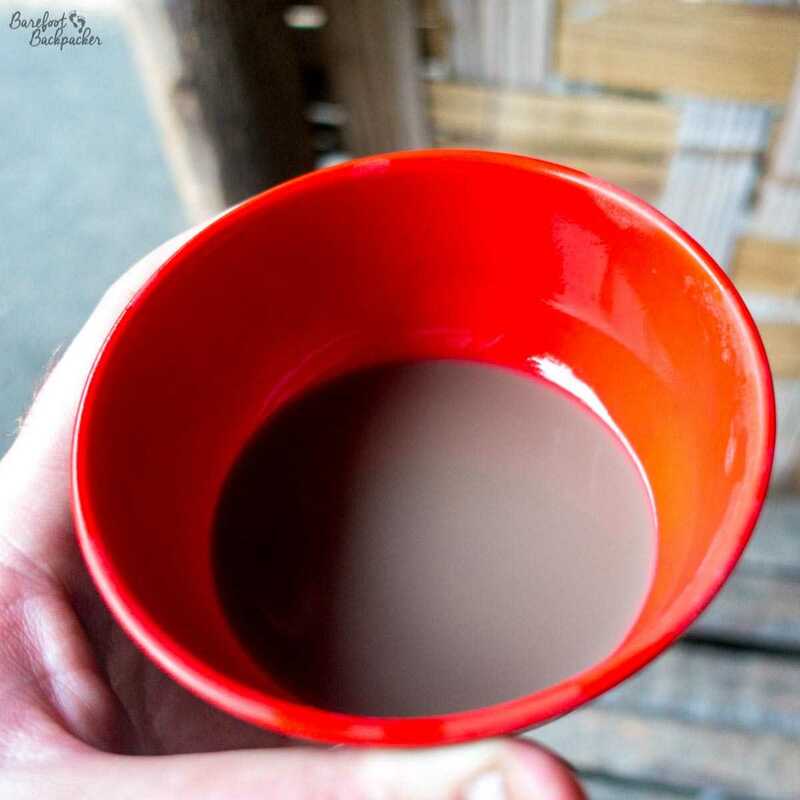 To be honest, kava is kava and it’s not like serving it differently will change the taste much, so the only reason to bar-hop would be for the social rather than the tasting experience. 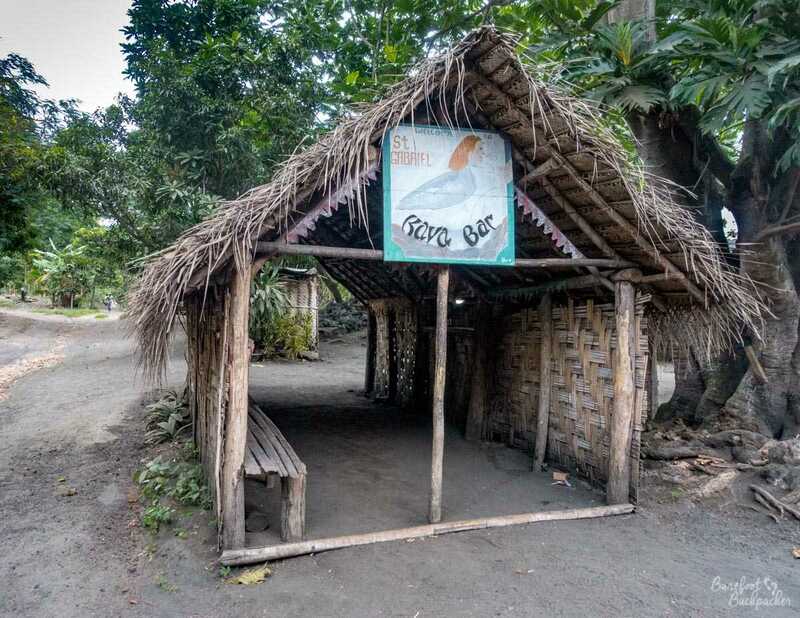 An example of a ‘kava bar’ – this one is near Craig Cove on the island of Ambrym. Kava is sold in two sizes, sometimes referred to as half-shell and full-shell. At the bar we went to, a ‘half-shell’ is 50VT and a ‘full-shell’ is 100VT. I wouldn’t be able to tell you how much liquid is in either measurement, but my half-shell filled maybe a quarter of the small bowl I was given. 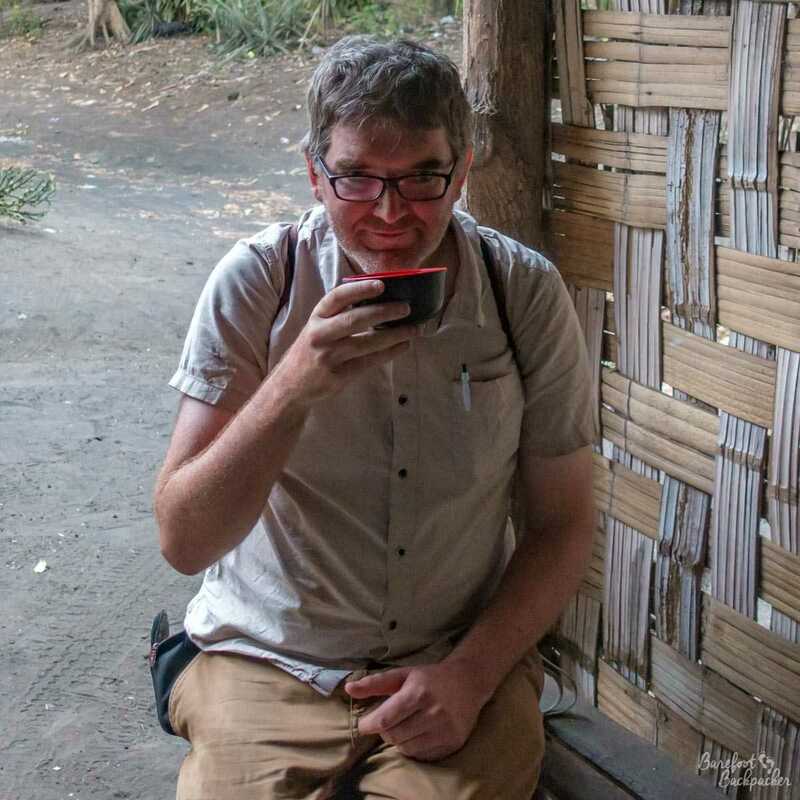 I’d gone with another backpacker I’d met at the bungalow – a solo female traveller from France, called Celine, who had had Kava once before herself, on the island of Pelle, and she … wasn’t keen on it but agreed with me that I ought to try it. Kava, in its final ‘drinkable’ form. First impressions are not great. Some people have commented that it looks a bit like muddy water, or possibly dishwater. To me it looked a little like old coffee – like someone had had a mug of coffee but left a bit at the bottom which had got cold and stale. It’s kind of like a brown colour, but not cocoa-brown, more like … muddy-pond brown. It moves around the bowl like water, so it’s not a thick-textured drink. It doesn’t smell of water though; rather it has a slightly earthy aroma, with notes of twig and moss. It tastes like it smells. Actually, let me be a bit more evocative. While in West Ambrym, I stayed for the best part of two days in a small complex of ‘bungalows’ in the woodland. There’s a series of forest trails around it that take you to the coral beach, the airport, a church ministry, and through a couple of small villages; these trails aren’t always clear but rather littered with dead leaves, tree roots, black volcanic soil and ash, and the occasional twig. Imagine distilling each bare footstep I made, pressing down on the trail, squashing all of this underfoot, and putting the remnants in a bowl mixed with a little water. That, that is what kava tastes like. The thing is, everyone knows this. Even those who make it know that it tastes pretty foul. And yet people will still drink it, they will go back and request more full shells, and maybe have five or more in an evening. The best way to drink it seems to be to let it stay in the mouth as little time as possible – sip it and swallow immediately, or, if you’re brave enough, just down the whole thing in one. You can tell what I think just from my reaction! So why drink it at all? Well, people don’t drink it for the taste, but for the after-effects. These are strongest on an empty stomach, which is why kava bars tend to open mid-to-late-afternoon – before the evening meal, just before it gets dark. Even as little as a half-shell develops a couple of the effects; your lips and mouth go a bit ‘tingly’ and slightly numb (in the same way, I believe, as the toxin in the Japanese blowfish), while your throat gets a slightly warm and possibly little sickly feeling. But have several full-shells and the kava acts as a kind of relaxant, a sedative. It’s not unknown for people to take a couple of shells and spend the next hour or so staring distantly at the horizon, literally contemplating the infinite. It’s not a drink to get violent on, the way many Brits drink beer; it’s not even a substance to feel mellow and relaxed with like Marijuana; rather it’s a more sociable form of classic 90s party drug Ketamine. Vanuatan ‘Special K’, maybe. It’s not the worst drink I’ve ever had (Tequila, Dandelion&Burdock, Dr Pepper), but even I would sooner have the Tusker lager. And that’s saying something. In other adventures on Ambrym, I hiked across the whole island, visiting two lively volcanoes and a huge ash plain. Kava sampled 8 August 2018 on Ambrym.